Are Stair Lifts ADA Compliant? The Americans with Disabilities Act (ADA) of 1990 was created to prohibit discrimination and ensure equal opportunity for persons with disabilities. This includes providing requirements for creating accommodations in commercial buildings for those with disabilities. The document details ADA compliance standards for commercial buildings, including design, construction, and alterations. If your building needs to meet the ADA codes, there are many requirements that need to be met. Many people believe that stair lifts are ADA compliant, when in fact they are not. The rules and regulations laid out by the ADA do not include stair lifts. If you want to meet the ADA requirements without installing an elevator, you will have to use platform lifts in your building. While stair lifts will not help your building become ADA compliant, platform lifts, also known as wheelchair lifts, will. Section 4.11 of the ADA details the requirements for compliance when installing platform lifts in a commercial building. If platform lifts are used at an entrance, they must facilitate unassisted entry, operation, and exit from the lift in compliance with 4.11.2. If you are planning to use platform lifts in your building, they must also meet several other requirements within the ADA, including the ASME A17.1 Safety Code for Elevators and Escalators. Commercial buildings legally must follow ADA compliance requirements. To avoid any legal issues, make sure that your building meets all the codes laid out by the legislation. 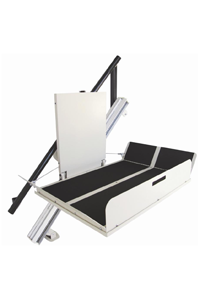 While stair lifts are not a good way to be compliant with the ADA, platform lifts are. Be sure your building, either being designed or altered, meets all of the ADA requirements.